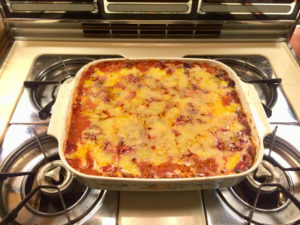 In this dish, we follow a traditional recipe for baked lasagna, with one important exception. Instead of blood-sugar-spiking, fat-storage-stimulating, grain-based lasagna noodles, we use fresh purple cabbage, cut into long strips about 2” wide. This recipe yields eight, large, nutrient-packed, palate-pleasing servings. 1. On a stove top with low heat under a stainless-steel pan, in order, add: 2 Tbsp. ghee; Turkey/Beef; Onion chopped; Garlic chopped; Celery, chopped; Mushrooms, chopped; ½ tsp. basil and oregano; ¼ tsp. pepper and salt. Cook 15 min. 2. Meanwhile, in a large Pyrex glass dish, melt 1 Tbsp. ghee, then spread 1/3 of cabbage, cut into long strips, over the bottom. Bake in an oven at 300° for ten minutes. 3. When meat and vegetables are lightly cooked, remove from stove top. 4. With large spoon, layer ½ of meat/vegetables on baked cabbage strips. 5. Layer ½ tomato, 1/3 of cabbage, then all sour cream, add spice to taste. 6. Layer the other half of the meat/vegetables on top of sour cream. 7. Layer on the rest of the cabbage strips, then the rest of tomato, return to oven to bake at 300°for 30 minutes. 8. Grate cheese; remove Pyrex from oven; sprinkle on layer of cheese evenly; return to oven to bake 10-20 minutes.